Metropolitan Anthony (Pakanich) speaks on how to protect oneself from the works of the Devil. Bypassing Paschal Joy or Why Are We Never Happy? Some believers underestimate the power of certain spiritual states. Many people do not even know about this power. For example, the power of joy. Many saints, who lived in different times and epochs, spoke about this phenomenon. Each of them in their own unique way reached the specified spiritual height. True joy is achieved only by genuine life in Christ. A person becomes spiritually stronger under the divine influence bringing one initially short and eventually longer moments of absolute joy. All hardships and trials fade before the miraculous power of this virtue. There are saints, who share a common trait: their joy of life. It is a rare and priceless gift. Spiritual joy reached so deeply into them that no one ever saw them sad or discouraged, and they sought to convey this joyful spirit to others. Such was St. Seraphim of Sarov. Of course, no virtues, no stages of spiritual states, including the joy of life, are achieved without humility. St. Seraphim was constantly aware of his sins (imperfection) and cordially repented of this. “Lord Jesus Christ, Son of God, have mercy on me, a sinner”, was his unceasing prayer to God. St. Anthony the Great resolutely said that if one does not have utmost humility, humility with all one’s heart, soul, and body, one will not inherit the Kingdom of God. For only deep humility can overcome the person’s evil, which lies in pride, selfishness, and self-esteem. Where there is evil, there can be no joy. Spiritual joy comes from spiritual purity. Demons cannot cause any harm to those, who are constantly filled with joy from the Source of Life. It is for this reason that one of the main tasks of the enemies of mankind is the desire to disturb our spiritual joy, for it is the protection against the works of the Devil. Yet how can a believer find this joy? How is it acquired? True joy grows out of our spiritual deeds: sincere prayer, purity of thoughts, heartfelt repentance, striving for the knowledge of God, and leading our life in accordance with the Gospel commandments. St. Seraphim of Sarov not only cared about spiritual joy, but also loved to see it in his neighbors and brothers. The Saint believed that just as all sins are contagious, so personal virtues are able to inspire and motivate other people. After all, when someone falls into temptation or despondency, it is important for them to see joy on the faces of their friends and relatives – and despondency passes. The Holy elder greeted everyone with the cry, “Christ is Risen, my joy!”The hearts of everyone near the elder thawed and calmed, their faith in Christ was born, and the realization of their sins came. This is a great example for all of us. We are constantly complaining, we are always dissatisfied with something, and it does not even occur to us that we should not show our sadness and foul mood in front of everyone, that we should reveal our sadness to God only. We should always look joyful in front of our neighbors and not embarrass them with a distressed face out of respect, love, and humility. Then God in His mercy will forgive and send joy to a reconciled soul. We rightly lose joy for our sins, for disobedience. A sad face among other things often indicates laziness, apathy, indifference, and dislike for good deeds. Of course, spiritual joy does not exclude seriousness and responsibility: they complement each other and serve together as a reliable shield against the Devil’s arrows. Nothing is impossible for those, who love God. Strong love erases any boundaries, moves mountains, and makes a person invincible. “Love for God makes believers capable of going beyond the limits of their nature”, taught the blessed Theodoret of Cyrus. Let us remember this and let us imitate the saints in virtues! 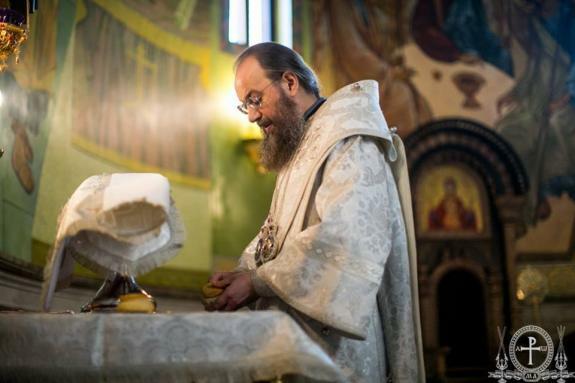 Metropolitan Anthony (Pakanich) is convinced that “the true miracle is the moral resurrection of a fallen person”.